Chemical free, does it even exist and what exactly does ‘pure’ even mean? I followed the quote which was linked to a site called mypure.co.uk and to my immense pleasure realised I’d stumbled upon the Mecca of natural makeup products! interpret “chemical free” to mean products made from naturally occurring chemicals such as plant extracts and oils or any of the thousands of naturally occurring ingredients which can be used safely in cosmetics. All their products are vegan friendly, free from chemicals with dubious safety records as well as being paraben and solvent free. Love, love, love! The powder gave a flawless finish and didn’t sit heavy on top of my base makeup or dry out my skin, which I often find happens with powders. The colour (olive) was even and matched my skin tones well. I’ll definitely be adding this to my daily routine. So easy to apply and actually felt like it was nourishing my skin. The cream itself was quite wet but with a good thick coverage and it was easy to build up and blend in. 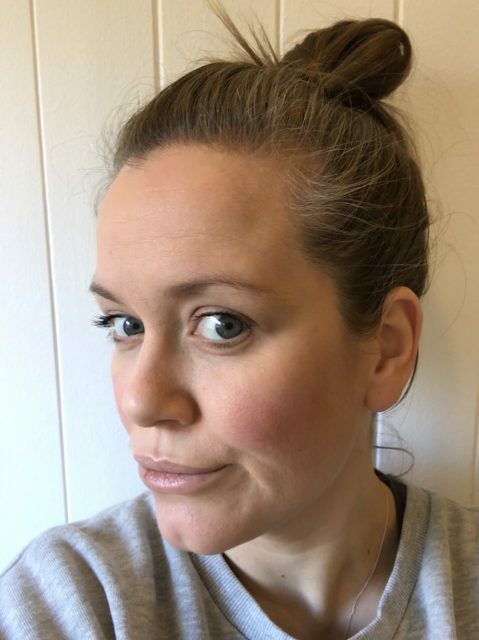 For my everyday (just nipping to the shops etc) makeup it was perfect, I didn’t feel that I needed to combine it with a primer or concealer as it gave a nice even, natural finish and lasted the whole day! *I prepped my face with a mandatory mum pout and then by simply cleansing and moisturising it with raw coconut oil. 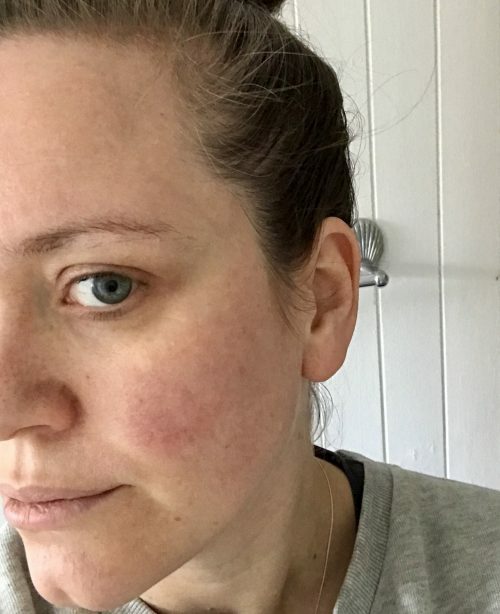 I finished my usual, basic daytime makeup ritual by also applying my favourite blusher from The Body Shop and a Black volumising mascara from Holland & Barrett (see below). 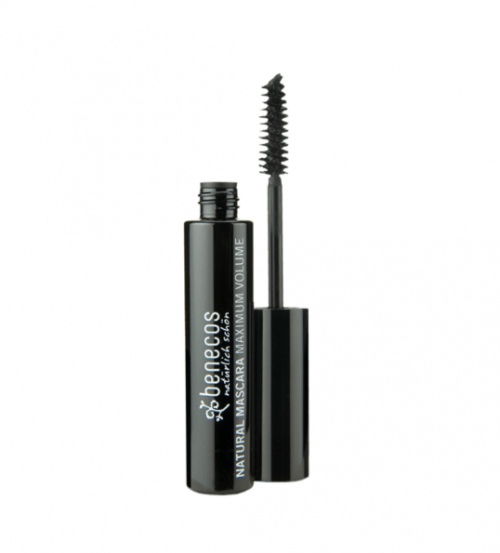 Black Natural, Maximum Volume Mascara £6.95 from Holland & Barrett. This oil infused nourishing body lotion is Eco-Certified as organic and has a Sea Buckthorn scent, which I’d describe as being a light citrus and vanilla-like aroma. The moisturiser has a good thick application without feeling heavy on the skin. A great all round body moisturiser with 100% of its total ingredients being from natural origins however, despite being organic I wouldn’t use on extremely dry and/or cracked skin as it does contain alcohol. A wondrously thick and luxurious cream, which we put to the absolute test by using on both my pregnancy belly and my husband extremely dry/cracked hands and it worked a treat. My husband particularly liked the fact that it had a very neutral aroma. For me the fact that it soaked into the skin quickly without leaving it feeling greasy against my clothes was brilliant, a lot of deep moisturising products leave the skin feeling overly oily. We both also only needed a single application that lasted the entire day, which is not only convenient but also great value for money! This one has now become an absolute family favourite! A soothing and gentle scent, which unlike most supermarket hand soaps is not over powering at all. And despite leaving your hands feeling soft and nourished there is no sacrifice to be made on how deeply it cleanses. A softly scented yet fragrance free, gel wash, which lathered up easily. Both mine and Theon’s skin tend to be quite sensitive but the wash was extremely gentle and kind and left the skin feeling soft yet cleansed. A very basic, but effective neutralising deodorant. I’ve used it for almost a week now without any issues however, I’m not sure I’m fully convinced to swap out my original roll on for this one, but definitely worth a try! 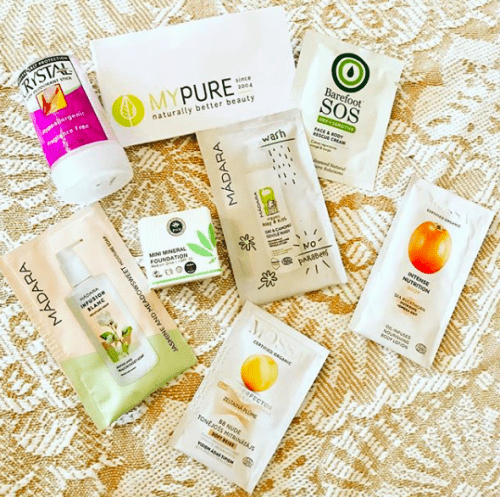 The greatest element of the Mypure site is that you can purchase samples of all their products from as little as 50p, in order to be able to try before you commit to fully investing in a new item. Their prices are extremely competitive and they have a continuous scheme of freebies on offer for multiple purchases. Definitely a must visit site for any conscientious cosmetics fans! This is not an endorsed review, this is simply me trying my best to fit some ‘mum-me’ time into my routine, which all of us need but, don’t always or ever get the chance to do. Let’s all commit to taking at least 5 mins a day to try out the cream sample in the bottom of your mum-bag, or to at the very least drink a cup of tea before it gets stone cold. You’ve more than earned it! If you’ve any tips on where to get similar products, or have any questions on those listed above we’d love to hear from you. Email us: enquiries@booberrit.com or better still comment below! 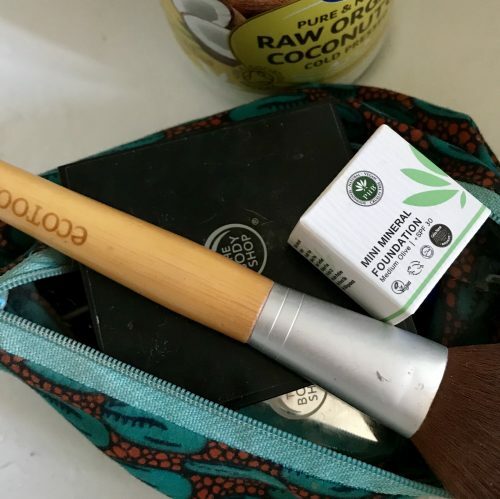 I think I originally got one of their mascaras as part of a birthday gift and thought the same as you!-I’d always assumed they were just health foods and supplements, but they actually stock lots of beauty products and organic beauty brands like Burts Bees for example! Oh this looks so good I need to try some new fundation! I’m glad you have a deodorant tip, I recently swapped out my trusty £5 a pop Sure one for a cruelty-free one and it failed! I ended up stealing Marks for the rest of the week, so I will try this one and report back. Oh you’re welcome, thanks for popping by!